\r\nShania Twain photo courtesy of UMG Nashville. \r\nOct. 2, 2009 — The Winter Olympics take place in Vancouver next year, and in the big run-up to the event, Shania Twain will carry the Olympic torch when it arrives in her hometown on New Year’s Day. \r\nShania has agreed to take the torch for 300 meters in Timmins, Ontario, Sun Media reported. She’ll use the flame to light a cauldron on stage at a ceremony in a local park that evening. \r\nShania continues country’s Olympic legacy. Billy Ray Cyrus carried the torch in Nashville during 1996 before the Summer Olympics in Atlanta, the Dixie Chicks and LeAnn Rimes performed in the opening ceremonies before the 2002 Winter Olympics in Utah, and Jo Dee Messina was a correspondent for Westwood One during the 2006 Winter Olympics in Turin, Italy. I\'ve loved watching every single minute of opening and closing ceremonies of Olympic games since I was a child. The Winter games have always been my favorite. These games will be the most special ever. Welcome to the world wide stage, Timmins!! \r\nTIMMINS, Ont. - Olympic officials say they won\'t be boosting security when Canadian country music superstar Shania Twain carries the torch Friday in her hometown of Timmins, Ont. \r\nTwain\'s run with the flame will come four days after a torchbearer in Guelph, Ont., fell to the ground in a confrontation between protesters and security personnel. \r\n"The security levels we have now are appropriate. There\'s no pre-plans to beef up security, but that might change on a moment\'s notice, based on crowd size or crowd behaviour,\'\' said Bert Paquet, spokesman for the Vancouver 2010 Integrated Security Unit. \r\nTorchbearer Courtney Hansen had just turned a corner with the torch in Guelph on Monday morning when she became entangled in the protest and fell. \r\nThe flame skidded against the ground but stayed lit. Guelph police have charged a 19-year-old woman with assault. \r\nIt\'s expected that Twain, a multiple Grammy-winner whose 1997 release "Come on Over\'\' remains the best-selling country music album of all time, will carry the torch during a two-hour celebration in Timmins on New Year\'s Day. \r\nThere have been no reports in Timmins media of any expected protests. \r\nPaquet said security officials "don\'t want to take away\'\' the uniqueness of the torch run - both for Twain\'s fans and the singer herself - by having undue levels of security. \r\nThe security unit is working closely with local police, Paquet said, and if any "intelligence\'\' shows there could be a problem then they\'ll act quickly. \r\nWe will try to take pictures if our hands don\'t freeze. 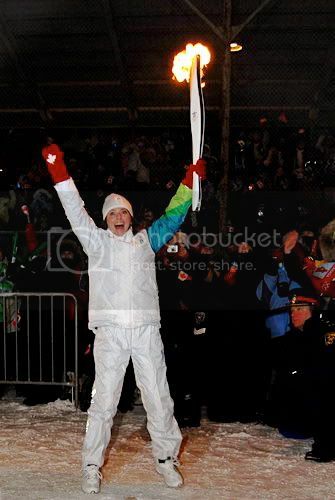 \r\nShania Twain jumps up smiling and waving as she enters the Hollinger Park in Timmins carrying the Olympic Torch. \r\nDespite bitterly cold temperatures and a biting wind, Shania Twain wowed the hometown crowd in Timmins this evening as she ran the final leg of the Olympic Torch Run into the Hollinger Park and Fred Salvador Field. More than a thousand fans that endured the minus 30 wind-chill, screamed and cheered as the hometown singing star entered the field. \r\nTwain, clad in the familiar white torchbearers uniform was clearly as delighted as her fans as she proceeded the final few metres to the stage, she stopped for a quick photo opportunity and jumped up and down, smiling and waving. Moments later, Twain ran onto the stage where she used the Olympic torch to light a ceremonial cauldron to kick off an evening of entertainment. \r\nThe official stage belonging to the torch run organizers could not be set up since the hydraulics were frozen. A massive television screen behind the stage was also a victim of the cold, as as the top portion of the screen was frozen and could not display a full image. \r\nTwain was the last of ten runners involved in the Timmins portion of the torch run which began in South Porcupine at about 6: 14 p.m. and ended at the Hollinger Park at 7:00 p.m.
\r\n"In a way it just feels really beautiful to be back up north in the cold. I know that sounds crazy," she said. \r\n"It wouldn\'t be Timmins," she laughed, "if it wasn\'t, you know, forty below with the wind-chill!" The appreciative crowd hollered and cheered their approval. \r\nI think this is so fantastic," she told a master of ceremonies. "What it shows is the spirit of the people from the north to be standing out there on the road for all these hours in the freezing cold; all of you, it really does show your spirit. I am glad to be home. I am glad to a part of this." I got a good picture of her running by. Will have to post it when I get home to ny. It was cold!!!!!!!!!! Shania looked great and she looks happy. Let\'s hope this means she is ready to get back to recording. \r\nTIMMINS, Ont. - The Olympic torch arrived in Timmins, Ont., on Friday evening, held aloft by a hometown hero. \r\nShania Twain carried the torch the final 400 metres into Hollinger Park, cheered on by thousands of fans who braved searing cold to see the country music superstar in person. \r\nTwain paused and waved to the crowd before bounding the final few metres onto the stage, where she lit the Olympic cauldron and passed the flame to the next torchbearer. \r\nTwain called the experience the "highlight\'\' of her life. \r\nAn international superstar and multiple-Grammy winner, Twain was born in Windsor, Ont., but spent most of her youth in Timmins, honing her talents by performing in local bars and clubs. \r\nHer 1997 record "Come on Over\'\' has sold more than 34 million copies, making it the best-selling album by a female artist of all time. \r\nThe torch continues its journey through northern Ontario on Saturday, making stops in a number of communities including Sudbury and Sault Ste. Marie. \r\nDoes anyone have an high quality version of this picture? It isn\'t the one from the Timmins Times. I don\'t know, is this any better? The size isn\'t quite right for my screen, but I don\'t care. FV, that pic of her is just gorgeous, and is now my wallpaper even if it is just a smidge distorted on my screen. \r\nmy January and february calendars. I\'ll be updating my site next week when I get back from Timmins. \r\nIt was really great to see Shania get this opportunity to carry the torch for her hometown and not have to do it by herself, Fred and eja were there to see. \r\nYou are making it a real visit there, eh? \r\n"I say go for your dreams, never lose hope and hold on to spirit," she said. "Not just of your hometown, although Timmins has a fantastic home spirit, of course it does, and I think I carry that with me everywhere I go. \r\nWhen the tiny, pretty brunette known by just one name in these parts came jogging toward the Olympic cauldron Friday night, of course the crowd in Timmins cheered. "Welcome home, Shania," one man called. But among the throngs who gathered to see the flame go by and celebrate a hometown superstar, there was one young woman who was especially excited. \r\nAfter all, if it weren\'t for Shania Twain, 27-year-old Andrea O\'Callaghan wouldn\'t live in Timmins. And she would never have met the man she\'s about to marry. \r\nHer first visit was six years ago - what Ms. O\'Callaghan sheepishly calls "my freaky stalker fan moment." Then living in east end Toronto, where she was born and raised, she drove the eight hours to Timmins and lined up overnight to meet the country singer at a short appearance, before turning around and doing the trip all over again to get her autograph at another event in Hamilton, 750 kilometres away. \r\n"I was wearing the same clothes," she said, laughing. It was the briefest glimpse possible of Timmins, no time for a romance. But the next time would be different. \r\nShe came that summer for a convention at the 12,000-square-foot Shania Twain Centre, which sits atop a small hill in a sleepy corner of town. The modern, soaring temple to all things Shania opened nine years ago, but it still has that new building smell - and compared to its largesse, the modest gold mining museum out back (the original attraction on this spot) is almost an afterthought. In the same way, Timmins may have been built by the gold beneath its streets, but outside of this part of the North and in countries far away, its name and fame have everything to do with Shania. \r\nFor Ms. O\'Callaghan and her fiancé, Rene Gaudreau, it was a simple story. He worked at the convention. They sat at the same tables at lunch, got to know each other, exchanged e-mail addresses. A visit here and there when she returned to finish her studies at the University of Toronto. \r\n"I was only going to move here for a year," she said, recalling the day three years ago when she packed up her life in Toronto and headed north. "And then I never left. Timmins takes over." \r\nNow Ms. O\'Callaghan works at the Centre, which fittingly serves both as a tourist attraction dedicated to the singer and as a community hall. \r\n"The recognition Shania brings to Timmins is amazing," said Tracy Hautanen, the manager of the Centre. "We get people from Finland who come here because she said, ‘Visit my hometown, it\'s a great place to go.\'." \r\nThe Centre greets between 5,000 and 7,000 people per year. \r\n"Because we bring people in, it contributes to the local economy," said Anne MacDonald, a member of the board. \r\nThe four staff members also spread the gospel of Timmins. And they have one tool to do it: the Shania mobile. Formally, it\'s the City of Timmins van, but nobody calls it that. A picture of the singer\'s face is plastered to each side, along with a photograph of the other symbol of the town: a gold mine headframe. Every June, Ms. O\'Callaghan and Ms. Hautanen pile into the Shania mobile and head to Nashville for the CMA Music Festival, a country fan gathering. There, they set up a booth, and invite people way, way up to Timmins. \r\n"They market for the North," Ms. MacDonald said. "You\'ve got to entice people to come North, period. And then you get them to see the attractions." \r\nIt\'s a highlight of the year for Ms. Hautanen, even though it\'s hard to stop in a parking lot without being held up by people who want their picture taken with the van. And she has to be careful not to speed, she said. \r\n"It doesn\'t blend in with traffic." \r\nFor Ms. O\'Callaghan, driving that van to Nashville means the transformation is complete. Not only has the Scarborough native made her home in Timmins, she\'s gotten downright evangelical about her town and the people in it. \r\nFriday night she stood among them, a dancing mass whose breath rose in great steaming waves into the sharp air, as the person who brought her here came running through. \r\n"Timmins has a fantastic hometown spirit," Ms. Twain said after she lit the cauldron. "I carry that with me wherever I go." \r\nIf Ms. O\'Callaghan is any indication, it\'s infectious. \r\nThe wedding will be in Timmins, in August. ("We had to make sure it was the weekend after the convention.") The city folk will just have to make the drive. \r\nNot even the most frigid temperatures could keep Timmins from showing off its community spirit as the Olympic flame made its way through the city on its way to Vancouver. \r\nThousands waited in Hollinger Park as country singing superstar Shania Twain made her way on the torch\'s final 300 metres of the Timmins leg. They all cheered as the precious flame lit the Olympic cauldron on stage. \r\nOfficials estimate anywhere between 7,000 and 9,000 people attended the celebration on New Year\'s Day. Many others lined the torch\'s route from Porcupine through Timmins. \r\nThe crowd erupted as Twain made her way into Hollinger Park toward the stage. She proudly carried the torch and lit the cauldron, before taking a few moments and speaking to the crowd, as her son Eja, looked on, waving from the front of the crowd. \r\n"This is so fantastic, it\'s pretty overwhelming," Twain said. "I know we could have probably had warmer weather, but in a way it just feels really beautiful to be back up North in the cold. \r\n"I know that sounds crazy, but it wouldn\'t be Timmins if it wasn\'t 40 below with the wind chill." \r\nTwain went on to say that the fact that all those people stood out in the crowd in the freezing weather only proves the spirit people from the North have. \r\nShe wished luck to all Olympians, and said how happy she was to be back in her hometown. \r\n"I\'m honoured," said Twain. 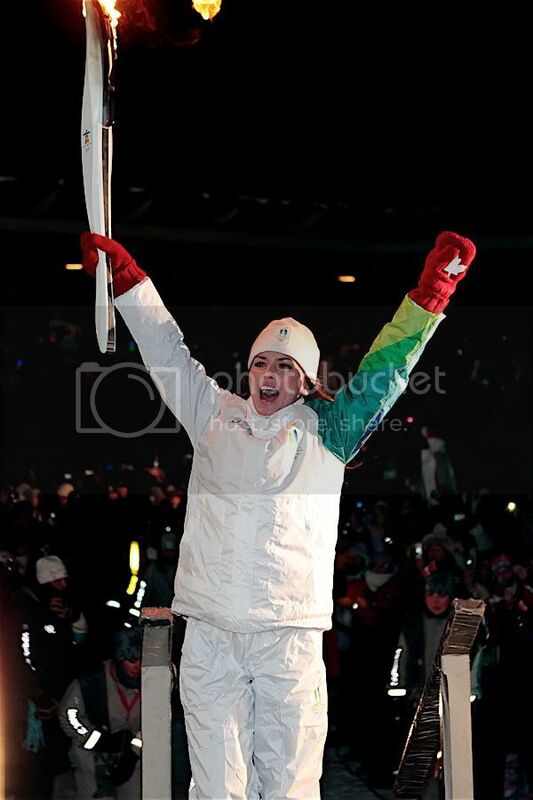 "I\'m extremely proud and it\'s a highlight of my life to be able to be here to carry the torch." \r\nWhen asked how she felt about the Olympics themselves being held in her home country, Twain said that no matter where she has travelled in the world, Canadians are much loved, and that is something Canadians should be proud of. \r\nShe also had some words of encouragement for all those out there in Timmins, both young and young at heart. \r\n"But just be yourself and take that with you wherever you go, that\'s what\'s most important." \r\nInteractive displays, and entertainment provided by the community, as well as the Vancouver Olympic Committee and sponsors Coca-Cola and RBC, kept the crowd warm, dancing and singing, as they patiently awaited the torch\'s arrival. \r\nLocal celebration committee chairman Timmins Police Service Sgt. Al Richardson said minus a glitch with the stage, organizers were thrilled with how things turned out. \r\n"We\'re absolutely excited, we had a few technical difficulties to begin the stage was broken when it came across Canada - it\'s a little too cold for it up here," Richardson said, "This is huge, to be part of the Olympic spirit to have this stop in our community. \r\n"It\'s once in a lifetime for Timmins, and our citizens, I\'m almost speechless." \r\nFor one Timmins student, being able to carry the torch, and even receive a hug from Twain, was a moment of a lifetime. \r\nFifteen-year-old Timmins High and Vocational student Riley Kolisnyk, was able to hand off the torch to Twain at the corner of Algonquin Blvd. and Brunette Rd. \r\n"This is wonderful, amazing, I can\'t believe it," he said. "I don\'t know how to explain it. It\'s emotional." \r\nRiley is a long-distance track runner. He said being able to be a part of the Olympic experience was a great experience. \r\n"It\'s the best thing ever," said Riley. "It was such an honour." \r\nMP Charlie Angus (NDP - Timmins-James Bay), as well as Mayor Tom Laughren were both a part of the ceremony, and Angus said Timmins is a community that knows the importance of community spirit. \r\n"When you look at a world with so much heartbreak and violence, the Olympic flame reminds us that we can come together to be something more," Angus said. "Here in Timmins, where so many people from so many countries came to build a life, it is a symbol." \r\nLaughren said that the World Under-17 Hockey Challenge taking place at the same time as the torch relay, only further proves what the city is capable of achieving. \r\n"When you see the atmosphere of the torch being carried in, it really makes you reflect on what the Olympics mean not only to the world, but specifically to Canadians and the people in Timmins," Laughren said. \r\n"We\'re very, very proud, and we\'re very glad things have worked out." \r\nLaughren\'s speech was met with roars from the crowd as he mentioned Timmins long ties with the Olympics. \r\nAcknowledging the efforts of Timmins Olympians Laurie and Kathy Kriener, as well as Jason Gervais, Laughren said Timmins is no stranger to the spirit of the Olympics. \r\nMuch discussion took place in the community regarding who was chosen to carry the torch on its last leg in Timmins, and Laughren said there was no shortage of people the city could have chosen. However, only one was allowed. \r\n"We wanted to ensure we had a great event and that we had people to come out," said Laughren, who only met the singing sensation for the first time yesterday. \r\n"For Shania to come back to her hometown and do this for us is really remarkable and in this weather we can\'t thank her enough. \r\n"I have to say she\'s a real trooper." \r\n	Want to attend Fan Con 9 in Timmins?